Jonathan Rea leads Marco Melandri, Tom Sykes and Chaz Davies in the opening race at Jerez in Spain on Saturday. Jonathan Rea said he threw caution to the wind as the World Superbike champion toasted his first ever victory at Jerez in Spain. 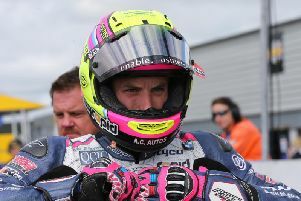 The Ulster rider, fresh from sealing a record-breaking third straight world crown at Magny-Cours in France, held off Ducati’s Chaz Davies and team-mate Tom Sykes to secure his 13th win of the season on Saturday. World Superbike champion Jonathan Rea won his first ever race at Jerez in Spain on Saturday. Rea had been holding second place in race one and was gradually closing the deficit to pole man Marco Melandri (Aruba.it Ducati) when the Italian rider was forced out with a technical issue. That left Rea clear at the front and he went on to take the chequered flag by 1.1 seconds from Welsh rider Davies, with Sykes completing the top three. Rea said he was ‘riding over the limit’ as he battled for his first victory at Jerez, safe in the knowledge that the championship was done and dusted. “I was riding way over my limit to try to chase Marco down. The gap was slowly coming, some laps not changing, but tenth by tenth I was getting excited,” he said. “In the end he had a problem and I am really sorry for him because he did not deserve that. We both deserved to be able to fight to the end. Northern Ireland’s Eugene Laverty finished in eighth place on the Milwaukee Aprilia behind his team-mate Lorenzo Savadori. Pata Yamaha pair Alex Lowes and Michael van der Mark were fourth and fifth respectively, with the returning Sylvain Guintoli claiming a solid sixth on the Puccetti Kawasaki. The second race is scheduled for 12:00 BST on Sunday. Jerez is hosting the penultimate round of the championship, which concludes in November in Qatar.